Above is the beautiful mansion where the President of the Federal Republic of Nigeria watched African Nations Cup, AFCON 2013 match between Nigeria and Burkina Faso in London. 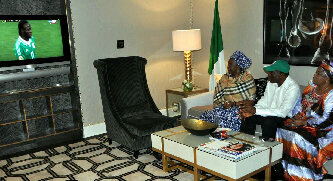 President Goodluck Jonathan, his wife Dame Patience and other officials watched the game live from here in London on Sunday. According to a source, the First Lady is a super football fan. Wao dat waz nice mr president.am wishn al d best in ur govt,i lov niaja,c.r.s,obubra an iyamoyoung..salute 2 d first lady..